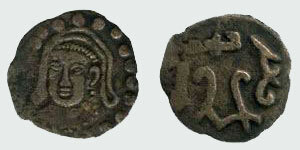 With name of Farnbag, 7th-8th centuries A.D. Obv. : Deity's head 3/4 to the left. Face is executed in a manner characteristic to Bhuddist iconography. Rev. : In the field a tamgha in the shape of a lyre, surrounded by Sogdian legend. (#41 O.Smirnova, Catalog of Sogdian..., #1434). Unknown ruler, 7th-8th centuries A.D. Obv. : Deity's head 3/4 to the left. (#41 O.Smirnova, Catalog of Sogdian..., #1480). 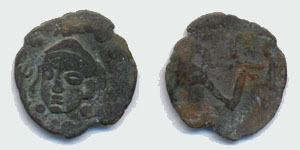 (#41 O.Smirnova, Catalog of Sogdian..., #1472). Anonymous khakans, 7th-8th centuries A.D. Obv. : To the right a tamgha in the shape of a lyre. 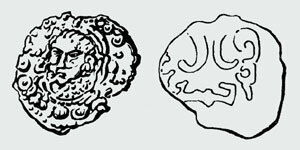 To the left an inscription in the Sogdian-Turkic semi-italic scrypt "khakan". 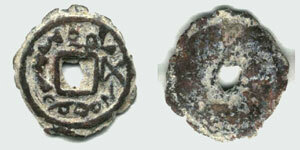 (#41 O.Smirnova, Catalog of Sogdian..., #1435). 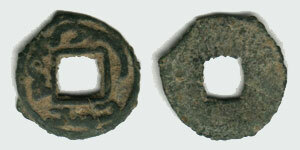 (#41 O.Smirnova, Catalog of Sogdian..., #1439). Obv. : To the right a tamgha in the shape of a lyre. To the left one word in the Sogdian-Turkic semi-italic scrypt "khakan". Rev. 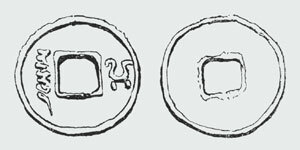 : Below an inscription in the Sogdian-Turkic semi-italic scrypt "algha". (#41 O.Smirnova, Catalog of Sogdian..., #1440). 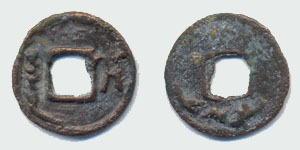 Tutuks in Ferghana, 7th-8th centuries A.D. Obv. 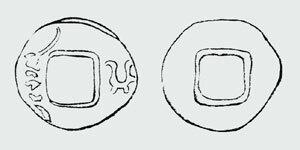 : Sogdian legend around square hole, runic "ash" to the right. (#41 O.Smirnova, Catalog of Sogdian..., #1445). Obv. : Sogdian legend "Godly Khaqan" above and below a square hole. (#41 O.Smirnova, Catalog of Sogdian..., #1365). The place of issue refers to the regions to the north of Syrdarya(Yaksart).